Knowing a top-notch eyecare specialist is essential, and Rhode Island is a tiny state that is rich in local businesses you can trust. From contact lenses to prescription sunglasses, you will find it all. Plus, many eyewear stores double as exam centers, so the upshot is that you can get your exams and check-ups, and prescriptions all in one spot. Here are the best spots in the state! At Blackstone Valley Eye Care, their recipe for success starts with the highest level of patient care and service, including access to optometrists with a combined 75-plus years of experience. They also have set up a friendly, compassionate atmosphere, as well as a personalized approach to vision care that includes the treatment of a wide variety of vision needs. Plus, you can find brands like Oakley, Dolce & Gabbana, Juicy Couture, Liz Claiborne, and more. Combining an eye care center with a boutique optical shop and a bilingual staff has proven to be a winning combination for Westminster Eyecare. Plus, this collection of doctors and technicians prides themselves in providing an ultra-high level of educated and compassionate customer care. Moreover, you will find the most advanced technology and equipment in the business as well as, pediatrics, geriatrics, and ocular disease services. It is difficult to beat an eyewear company that offers so much in one single location, but Bling Eyewear has managed to fit an eyeglasses shop, exam services, and even a LASIK Surgery center into one place. And, if that was not enough, you will also find contact fittings, prescription lenses, and sunglasses right here. Plus, they accept a wide variety of insurances and have excellent customer service. Established in1989, Gregory's Optical offers, by all accounts, friendly and professional service and only the finest optical brands. You’ll find hand-made European and American eyewear, iconic sunglasses, and brands like Oliver Peoples, l.a. Eyeworks, J.F. Rey, Theo, and Silhouette. Plus, Gregory’s will repair your old specs, fill prescriptions, make sure your glasses are fitted correctly, and even work with progressive and frameless lenses. Based on a philosophy of total and complete customer service, Shades operates on a three-part foundation of your intended use, your budget, and your fashion sensibilities. Established in 2007, Shades had built its names on services offered before, during, and after the sale of each and every pair of glasses they sell. Founded in 1989 by Steven DiLibero, a father and son practice, is by many accounts a local favorite. You’ll find prescription sunglasses, frames, contact lenses, and exam services, as well as name brands like Gucci, Prada, Cartier, Celine, Dior, Ralph Lauren, and so many more. If you have luxurious taste in glasses and want the most exclusive designs, this is the place to come! One of the most venerable eyewear and exam practices on our list, Kilanoff was founded in 1933 when Dr. Max Klibanoff established his eye care practice. Now, the second and third generations of Klibanoff’s continue to provide superior eye care in their new state of the art facility, and you will find eye service and products from Burberry, Tom Ford, Tiffany, Giorgio Armani, and more. With a history that dates back all the way to the 1950s, Garden City Eye Care offers an array of eye care services, like pediatric and senior eye exams, and products. From dry eye solutions to emergency care and prescription filling, this eyewear store has got it all. Plus, find brands like Maui Jim, Ray-Ban, and Lacoste frames in this one-stop eyewear spot. Established in 1964, Coventry Eye Care has been serving the needs of northern Rhode Island. 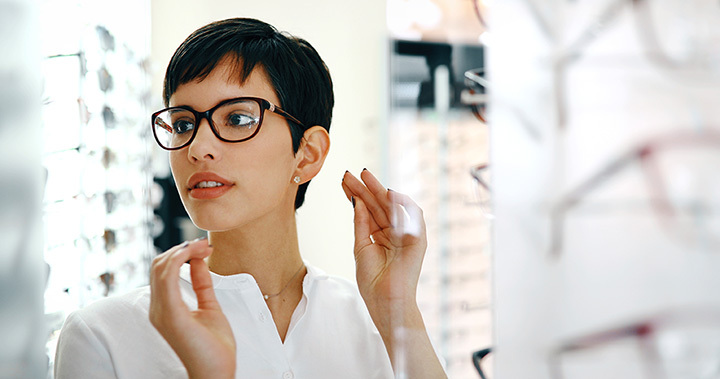 Offering patient-centered services, as well as products from Coach, Gucci, Harley Davidson and more, this eyewear center is one-stop shopping for eye exams, prescription-filling, contact lenses, high-quality lens coatings, and more. Customer service is the name of the game at Ferocious Eyes Optical Center in East Greenwich. With services ranging from contact lens fittings to eye exams, you can be sure that your optical health will be in great hands! Their sunglasses, eyeglasses, sport glasses, and various lens options give you quite the selection to choose from. You won’t be disappointed with their selection and can certainly count on them for many years to come!